Haig was a career military officer who served in the Korean and Vietnam wars. He was military assistant to Henry Kissinger (when he was Nixon’s national security advisor), then became White House Chief of Staff at the height of the Watergate scandal from May 1973 until September 1974. Haig proved a great crisis manager, who (many believe) kept the government running while Nixon struggled with Watergate. 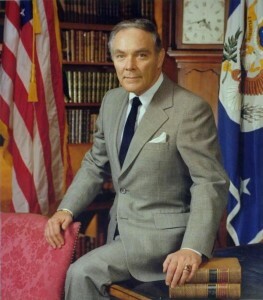 After serving as supreme commander of NATO from 1974 to 1979, Haig was appointed secretary of state by Ronald Reagan in 1981. He made a major gaffe when, after the March 30, 1981, assassination attempt on Reagan, Haig declared that he was “in control” in the White House, asserting—unconstitutionally—that he was third in succession to the presidency. Haig resigned in 1982.